Three years ago Irish audiences fell in love with Noirin Dawson (Pauline McLynn) and her friends and neighbours in the smash-hit, sold-out show Dandelions. Now she’s back, several years later, with a grown-up daughter and none the wiser about just what’s coming down the tracks. In Fiona Looney’s gloriously funny, bittersweet follow-up, October, she’s joined by a star-studded cast, including Lorcan Cranitch (Ballykissangel, Cracker), Ailish Symons (Bachelors Walk, The Clinic) and, making her first stage appearance in Ireland, Victoria Smurfit, who plays her younger sister Carole – back from London, complete with Jimmy Choos, a Prada handbag and a newly acquired ‘e’ at the end of her name. Is blood thicker than water? What is a grown woman doing on a bouncy castle? And what does the Child of Prague have to do with anything? 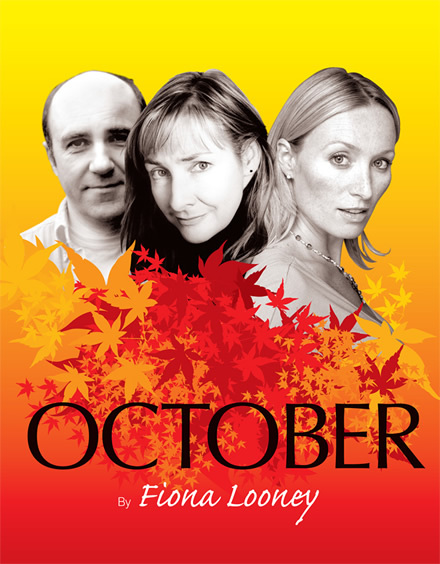 It could only be Fiona Looney’s October … in the Olympia, in February. Appearance on Matthew Wright TV show. 28th – hosting a fashion show with Design Platform in the Marriott, Enfield, in aid of World Vision Ireland (of which I am Patron). 16th: am presenting a book edition of RADIO CAFE live on Radio Scotland. 1st : My short story IMAGINE is broadcast at 3.30 as part of the BE PREPARED season on Radio 4. There is a story daily from Monday 30th July to Friday 3rd August, inclusive. Enjoy! ‘equally amusing is BRIGHT LIGHTS AND PROMISES by Father Ted’s Pauline McLynn, set in the melodramatic world of a London theatrical agency.